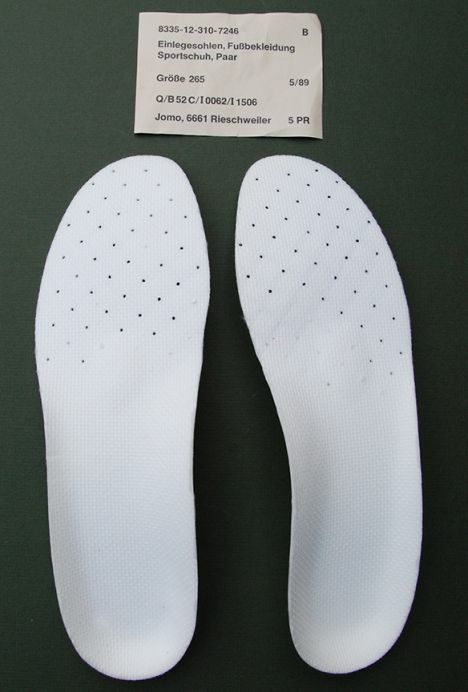 These German Army (Bundeswehr) Orthotic Shoe inserts (insoles) are lightweight and comfortable! Brand new, unissued condition, late 1980s/early 1990s surplus. Foam inserts have good arch support, and ventilated, fabric covered foot-beds. Available in sizes below only. Great for sports shoes or dress shoes, and can be trimmed for a custom fit. Get a pair and you'll be walking on cloud nine! While they last!